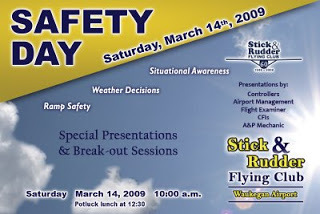 Stick & Rudder Flying Club is holding a safety day on Saturday. The public is welcome so, if you are in the area, please stop by to visit the club and learn something at the same time. Hope to see some of you there tomorrow. Update: Sunday 3/16 – The Safety Day was a sucess with good attendance and some very helpful information provided by knowledgable speakers. I look forward to this being an annual club event. A special thanks to club member Robbie C. for organizing it.